Our prophetic decrees in this hour must come from the low place. Angels are calling us to join them before God’s throne where every worshiper comes face down. Now is the time to humble ourselves in deeper worship as the precursor to our proclamations. I had an angelic encounter several weeks ago where I was given a specific directive in how to pray in this next season. In the encounter, I saw and heard angels speak to me from the ground. I saw their faces on the floor speaking from the ground up – not from heaven-down. Next, one of them said to me “Ask God what He wants at the beginning of your prayers…not at the end.” Even as I heard this, I sensed that all of heaven was standing ready to charge to earth. They were in formation with swords drawn, waiting for the command to come. Whether it be the actual biblical text or the later addition, both of these truths have been prophesied and declared over this nation. We have been crying out for deliverance from the evil one and have been declaring the ultimate authority of Christ’s kingdom. These prayers are good and they are true. Even so…I believe the Lord is revealing the urgency at this time concerning the posture of our hearts, not just the focus of our prayers. We are not fighting to “regain” power. We are contending to secure our identity and inheritance as sons and daughters of the King. This is not a POWER CONFRONTATION. This is a POSITIONAL SHIFT. Where the kingdoms of this world have presumed positions of power and authority, the Lord is now realigning and re-positioning us as the original gatekeepers and stewards of the earth (Genesis 1:28). True power and authority only come when we are in right relationship with God and with one another. This is the shift that is taking place. But, before we can take our position seated with Him in heavenly places, we must posture our hearts before His throne in worship. I believe I saw and heard the angels on the floor representing the call to HUMILITY and an acknowledgment of God’s HOLINESS. 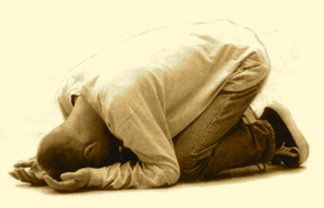 In Revelation, numerous pictures are given of the angelic host in worship around the throne, and in each instance, they are face down on the floor. The SHIFT that is taking place in the governments of the world is also happening in the Spirit. There is a shifting, not simply of power, but of identity. We must know who we are and posture our hearts in humble worship before we can be in the right position to affect change. It is only when we are in the right position that we carry the right authority. What we are “coming against” in this battle has been a spirit of PRIDE and of WICKEDNESS. The only way to displace these principalities is in the opposite spirit of HUMILITY and HOLINESS. The Lord is reminding us to come before Him in humility and worship before we do anything else. Without a keen awareness of His holiness and daily living from His Presence, our decrees will be short-lived. WORSHIP is key in this hour and heaven will be attracted to our humility as we come face down in recognition of His holiness. It is in this place of worship that our prophetic decrees will have power and authority. It is this reality of His Presence that will ultimately shift the balance of kingdom authority and the identity of every nation. Wanda, this speaks to my heart about the times we are in. Thank you for your faithfulness to stop, listen and then release what you hear and see. The Body, His Bride, needs to know we are on the right track with God. To humbly pray “Thy will be done on earth as it is in heaven – before we begin.. I love this. I received this from a dear friend, Pat Demsey. Thank you for posting this, Wanda. A year ago I dreamt of 4 angels kneeling in the corner of my bedroom and have been asking Holy Spirit for an interpretation. I teared up as I read it. It confirms that God has told me to pray for holiness in His church, for many are unprepared, scantily clad in white and not fully dressed in the white we were meant to wear. I deeply appreciate this prayer instruction. We can come any time to the throne of grace. Ask the Holy Spirit for wisdom and revelation concerning her healing. No quick or easy answers to your question but I know healing is available and possible. He is no respecter of persons and desires to heal all. Much grace to you! I shall continue; she has experienced some relief since I asked my question…I believe and am persuaded HE does..Thank you ! May i send donation via Paypal to your email website address?